alpineSAR had its genesis in the Victorian Nordic Rescue Service (VNRS), which was formed in 1979 as a skilled volunteer cross-country ski search and rescue group. Within 12 months of formation VNRS established a subgroup to provide cross-country ski patrol services at Mt St Gwinear and shortly thereafter at Lake Mountain. VNRS also assisted with the establishment of ski patrols at Mt Stirling and at Mt Reynard (as part of the SES Maffra Unit). As these groups matured they evolved into separate independent patrols at their own mountains. In 2003 VNRS extended its membership criteria to also experienced bush walkers as well as skiers. 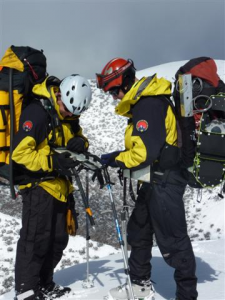 VNRS became Alpine Search and Rescue Victoria Inc. in 2007.
alpineSAR members are called out for search and rescue as members of Bush Search and Rescue (BSAR), by Victoria Police Search and Rescue Squad. When requested to join a search, available members gather at a central meeting place from where a Victoria Police bus takes us to the search control area. Often searches happen in bad weather and difficult terrain. We work in small teams, with other BSAR and emergency services personnel. While we may come back into base by the end of the day, we are just as likely to stay out overnight, depending on the search area we have been allocated. The number of searches varies but may be from one to five a year. Members are not required to attend every search. The most rewarding aspect of membership is when a search is successful – finding the lost person or group, helping them with any first aid, and organising to get them out of the bush and back to their families is a great outcome. Sometimes though the search is wound up without the person being found. We have a peer support program that assists with personal debriefing as a routine part of the whole process. Searchers responding to a call out are expected to be able to spend three days in the field. On a large search a second call out will bring in fresh legs and allow the search to continue for extended periods. 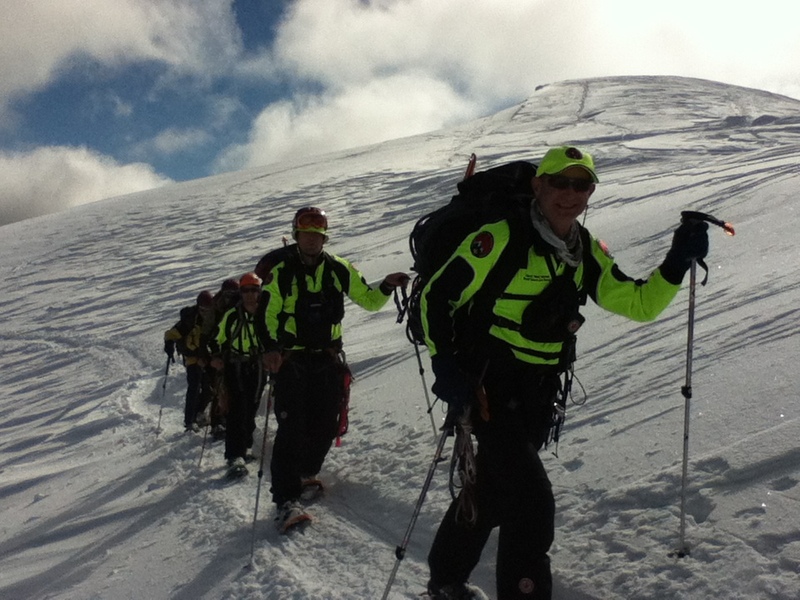 Members attend training with a couple of single days and a multi-day winter training event each year. The training builds on members’ existing camping and bush/alpine skills by adding search, leadership, remote patient management, radio, GPS, steep snow and ice, avalanche rescue and other skills required in a search or rescue situation. A key part of the training is learning to operate as a well-functioning team with the other members. We also join BSAR training events; usually one weekend a year. We have formal competencies in fitness, GPS, radio, navigation, first aid, knots and lashings, search techniques, steep snow and ice and avalanche rescue. To maintain Active call out status alpineSAR members must complete at least four days of training over a rolling 2-year period. alpineSAR has a committee structure with Chairman, Secretary, Treasurer and committee members who manage the day to day activities of the club. These activities include maintaining callout lists, newsletters, arranging training, new member applications, representing alpineSAR at BSAR meetings, etc. The Annual General Meeting is held each spring. The alpineSAR annual membership fee is currently set at $50.00, and there is a $50.00 entrance fee which covers the cost of badged shirt and cap for new members.